Overnight oats are so versatile. You bung the oats with some milk (any kind is fine and nut milks work really well too) and leave in the refrigerator overnight and voilà, breakfast sorted. 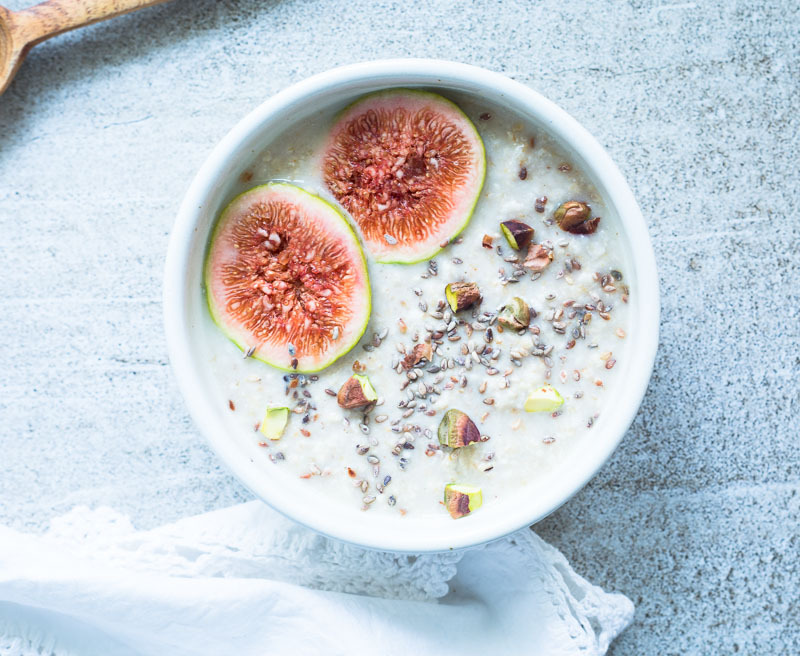 I think we have found ourselves bang in the middle of this chia pudding/oat/smoothie bowl revolution and it’s not hard to guess why: it’s so simple to throw together, looks impressive (especially if you are a ninja fruit carver), and most importantly, super healthy. I seem to have inadvertently fallen into this food fad rabbit hole, but I just (apparently) made some sesame butter last week. I made it the same way I’ve been making tahini all this time, to later find out that what I had actually made was in fact sesame butter. WHAT. Not that it matters at all to me but if you really want to know, the distinctive difference is that tahini is made with hulled sesame seeds (only the kernels) whereas the butter version uses unhulled. While some purists claim that to make tahini the authentic way sesame seeds shouldn’t be toasted, others swear by this method. But semantics aside, I use both tahini and sesame butter interchangeably and honestly can’t tell the difference. The only thing I would caution against if using store-bought tahini in this recipe is to make sure it doesn’t contain too much oil. 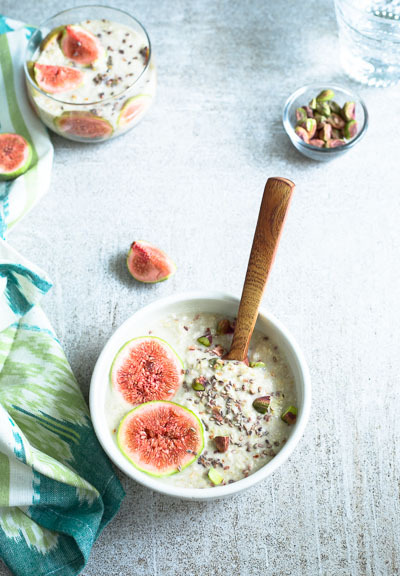 Figs and sesame work really well with the oats giving it a slightly savoury twist. Sweet and savoury together is always a delightful thing. Honey was my sweetener of choice. 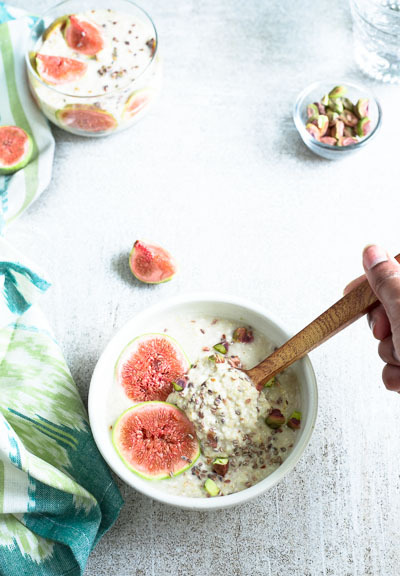 Figs, tahini, and pistachios give this recipe a slight Mediterranean feel so I went with the flow with honey for sweetness. If figs are not in season, bananas are my go-to here. Soak oats in milk and leave covered in the refrigerator for at least 6 to 8 hours. Make the sesame butter: toast sesame seeds in a dry pan over medium heat until lightly browned. Add to a blender with olive oil and a pinch of salt and blend for 1-2 minutes. Scrape down the sides of the blender jar and continue blending until it is completely smooth, about 4-5 minutes. This butter can be made a few days in advance and refrigerated until ready to use. To serve, divide the oats between bowls. Add some milk or water to loosen out the consistency if needed. Stir in the honey and sesame butter and top with figs and pistachios.